The short dark days of winter have been getting brighter and longer since the winter solstice marked the shortest day of the year on December 21. The Celtic calendar denotes February 1 as the pagan festival of Imbolc, the first day of spring, and celebrations are in order to commemorate warmer, longer days and the evidence that new growth is on the way. February 1 also corresponds with the feast day of St. Brigid, who along with Patrick, is one of Ireland's patron saints. St. Brigid was born in 451 AD in the town of Faughart in County Louth, Ireland; Faughart honors its native daughter with a shrine and well that regularly receive a substantial amount of tourists and pilgrims. She was the daughter of Dubhtach, a Leinster pagan chieftain, and Brocca, a Christian slave woman who had been baptized by none other than St. Patrick. Because her mother was a slave, she too was a slave; however her father notice her works of charity and eventually granted her freedom. St. Brigid founded monasteries in Kildare and she is credited with establishing the first order of nuns in Ireland. Kildare became a center of religion and education and her small monastery eventually evolved into a cathedral city. St. Brigid is remembered for her great charity and kindness and is second only to St. Patrick, among Ireland’s heritage of saints. Thousands of Irish woman throughout the world are named Brigid in her honor. Passion of Christ to her father, a dying pagan, she wove a cross from the straw-like rushes strewn on the floor and was able to baptize him just before his death. In those early Christian times the farmers adopted the custom of making these same crosses at the beginning of spring to protect their holdings, placing the handmade straw cross in prominent positions in their houses and barns. The tradition of making the crosses on January 31, the eve of her feast day, continues to the present day in Ireland and abroad. 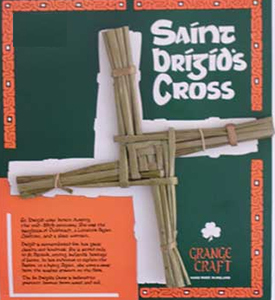 The St. Brigid’s Cross is believed to protect the owner from want and evil. The Irish Gift House is proud to feature a fine selection of St. Brigid's cross necklaces and related jewelry such as charms; this jewelry is made in Ireland by Solvar. Naturally we also offer many Irish made St. Brigid's wall crosses along with various gifts that include a tankard from Mullingar Pewter and several ornaments.